Combining development, production, trading and marketing, Sino Cable Gland Factory is one of the most professional manufacturers and exporters of Industrial Cable Glands / Cord Grips in China. (1) Nylon (Polyamide or Plastic) Cable Glands with PG, Metric, NPT, G, BSC & BSP Connection Thread. (2) Metal (Brass or Stainless Steel) Cable Glands with PG, Metric, NPT, G & BSC Connection Thread. (3) Nylon (Polyamide or Plastic) Cable Glands with Spiral Strain Relief Spring (with Spiral Flex Cable Protector / with Bending & Kink Protection). (4) Metal (Nickel-plated Brass) Cable Glands with Spiral Strain Relief (with Spiral Flex Cable Protector & with Traction Relief Clamp). (5) EMC/EMV/EMI Metal Cable Glands, EMC/EMV/EMI Metal Cable Glands with Spiral Strain Relief Protector (with Anti-bend & Anti-kink Protection). (6) Nylon (Metal) Reducers, Nylon (Metal) Enlargers, Nylon (Metal) Blind Plugs, Sealing Plugs, Dome Plugs, Hex Plugs, Locknuts, O-rings / flat Washers, Fittings & Accessories. (7) Nylon (Stainless steel) Cable Ties, Cable Clips & other wiring accessories. (8) Prensaestopas en nylon, Prensaestopas en poliamida, Prensaestopas en plástico, Prensacables de poliamida (nylon o plástico) & Prensa-cabos em nylon, Prensa-cabos em poliamida, Prensa-cabos em plástico. (9) Pressacavo o Pressacavi poliammide & Holkkitiiviste muovi tai Holkkitiivisteet muovia & Kabelforskruning polyamid eller Kabelforskruninger plast & Pakknippel polyamid eller Pakknipler plast. (10) Kabelverschraubungen aus polyamid oder kunststoff, Presse-étoupe plastique, Kabelwartels polyamide & Wurgwartels kunststof. (11) Forskruvningar eller kabelforskruvningar i plast (polyamid), Presgarnituri. (12) Forskruvningar Polyamid, Kabelska uvodnica & Kabelske uvodnice. (13) Verschraubungen, Prensacables metálicos & Prensacables plásticos. (14) Bridas de nylon, Abrazaderas de nylon, Amarres o amarras plásticos. (15) Presetupa sau Presetupe din plastic (poliamida / metal), Polyamid (naylon / plastik) Kablo Rakoru. 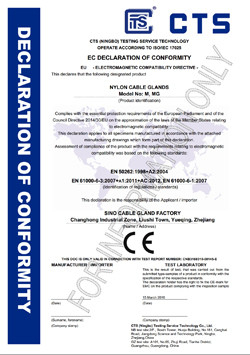 From 2004~2016, our company has obtained CE, ROHS, PAHS, REACH, SGS, IP68, IP69K certificates to ensure the quality and application of our wiring accessories in the industrials of electricals & electronics, home appliances, machineries, etc. 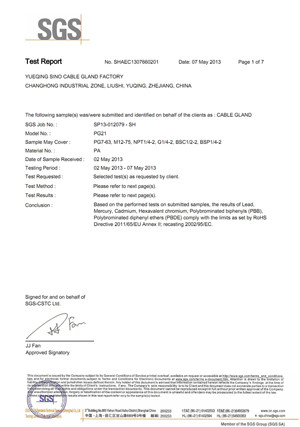 With good quality, advanced production technology, currently our products have been exported to over 100 countries and have won high reputations in many countries and regions such as U.S.A, Canada, Mexico, Argentina, Brazil, Chile, Peru, Colombia, Cuba, U. K, Italy, Germany, Ireland, Finland, Sweden, Cyprus, Poland, Spain, Australia, New Zealand, Malaysia, Hongkong, Taiwan, etc. With powerful technical strength, advanced production equipment, we insist in the principle " Living based on quality, Developing based on credit " and continuously improve our quality to meet the demands from customers all over the world. Department of Research and Development: 1. Main products: nylon cable glands. Factory size: 300 square meters. Market shares: 70% for domestic markets, 30% for overseas markets. Department of Research and Development: 1-2. Main products: nylon cable glands & metal cable glands. Factory size: 1000 squre meters. Market shares: 50% for domestic markets, 50% for overseas markets. 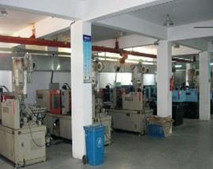 Automatic injection molding machines: 12. Main products: nylon cable glands, metal cable glands, flexible tubes. Factory size: 1800 squre meters. Market shares: 40% for domestic markets, 60% for overseas markets. Automatic injection molding machines with automatic feeders: 20. Main products: nylon cable glands, metal cable glands, flexible tubes, cable accessories, other new products. Factory size: 4000 squre meters. Market shares: 20% for domestic markets, 80% for overseas markets. Our products are for all countries in the world, but the major products market are for Europe, Asia, North America, Central America, South America and Oceania. Nylon Cable Glands, Metal Cable Glands, Cable Ties and other accessories. We have a professional quality control team who are dedicated to ensuring the premium quality of the products which is what we are always pursuing. MOQ: 100pcs-1000pcs. 3-5 days after the deposit is received as normal. A professional R&D department in our factory, who can also develop new products according to customer's special requests. We have a highly efficient and skilled team who are dedicated in development, production, inspection and sales of our products, they work together to supply good support to make sure everything works as normal. R&D team is responsible for developing new technology and new products to expand the requirements from different customers. 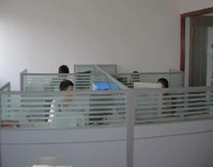 QC team is responsible for inspecting parts, packing, semi-finished products, finished products and final packaging. 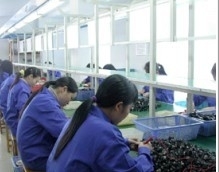 Production team works in three shifts of eight hours to ensure the timely supply of individual parts. 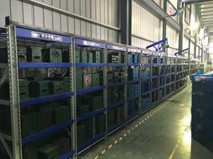 Assembly team & Packing team are responsible for fastly and efficiently assembling all the parts into finished products, and then deliver qualified products to packing department for final packing after inspection.